Central idea: The Baptism of the Lord is an epiphany of the heart of the Blessed Trinity. Doctrine: The saving love of the Blessed Trinity. Practical application: Humble lives of prayer. To view Lectionary 21, click here. Isaiah foresees the Messiah, chosen by God, endowed with God’s spirit, formed by God. This chosen servant’s work is not just for Israel: it is universal, for the nations, for the earth. He will be the covenant between God and humanity. His work is justice: to put men in a right relationship with God and one another. His work will not be accomplished by might or violence. God is the mighty creator and sustainer of all creation. Whether looked at from the more primitive, prescientific point of view of direct observation of the heavens and the earth or from the most modern scientific perspective, the universe is awesome in its age, in the complexity and interactivity of non-living and living beings, and in the power and dynamism in all things. Thus, how great, powerful, and wise God must be who calls everything that exists in creation out of nothing and who sustains it in being at every moment. This psalm also hints at the Holy Spirit when it speaks of the light, wind, fire, breath, and spirit. As Isaiah foresaw, Christ’s work is justice: to put men in a right relationship with God and one another. He does this by delivering us from our sins, cleansing us of them, and training us to live rightly. The Jews who came to John for his baptism in token of repentance from sin had an intense expectation that the Messiah was about to arrive. They wondered if he was John. The mightier one John pointed them to would have for them a baptism of the Holy Spirit and fire. Why did Jesus want to be baptized? Why did God the Father and God the Holy Spirit choose to reveal themselves here? The Homiletic Directory (HD) provides answers. Last week we celebrated the Epiphany. The Church actually sees the Epiphany as three events that manifest the divine glory of Christ. They are the appearance of the magi at the time of Jesus’ birth, the Baptism of the Lord at the Jordan, and the sign Jesus worked at the wedding feast at Cana at the beginning of his public life (HD 131). 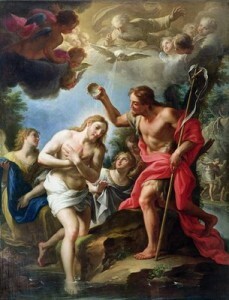 The Baptism of the Lord is “an epiphany of the mystery of the Holy Trinity” (HD 131). God the Father reveals that Jesus is his beloved son and that he is well pleased with him. The Holy Spirit descends in the bodily form of a dove as confirmation. This “epiphany of the mystery of the Holy Trinity” is one of the ways that God has revealed that he is both one and triune. This epiphany also reveals something of God’s inner self. Why is the Father “well pleased” with the Son? Jesus did not need John’s baptism because he had nothing of which to repent. Rather, he wanted to stand in solidarity with us sinners. “[W]hat pleases the Father is precisely the Son’s willingness to stand in solidarity with sinners. In this way [Jesus] shows himself to be the Son of this Father, this Father ‘who so loved the world that he gave to it his only Son’ (Jn 3:16). In the same instant, the Spirit appears like a dove, descending upon the Son, functioning as a sort of accreditation or authorization of the whole unexpected scene.” (HD 133) So, in the heart of the Blessed Trinity is not wrath but tender mercy toward us sinners. Why did this manifestation occur here? “Jesus’ baptism by John was not his ultimate baptism but an acting out in symbolic fashion of what he would accomplish in the baptism of his final agony and death on the cross. For it is on the cross that Jesus shows himself, not merely in symbol but in very deed, in complete solidarity with sinners.” (HD 136) After Christ’s death, the centurion echoed God the Father’s declaration: “Truly this was the Son of God!” (Mt 27:54). We ought to always have an inner happiness because the Blessed Trinity holds us in loving approval. Because of events like the Baptism of the Lord, it is possible for us to have constant lives of prayer. If we were not beloved by God, if God were not well-pleased with us, we would not be able to meditate, dialogue with God, or contemplate his presence. How could we stand constantly being in the presence of a person who basically hates us? But because we are beloved and approved, we can think about Him, talk to Him, and sit in silence before Him listening. Thank you for catching this and bringing it to my attention. All of those parentheticals should be HD and all refer to the Homiletic Directory.